The nations of the world gathered in Bonn, Germany, for the 23rd meeting of the Conference of Parties (COP23), the ongoing global discussion for action on climate change. While the Trump administration has announced plans to withdraw from the Paris Agreement, US cities, states, and corporations have stepped up their plans to cut carbon emissions. These “sub-national” groups had a strong presence in Bonn, with a large delegation led by California Governor Jerry Brown and former New York City mayor Michael Bloomberg. President Trump announced the US withdrawal from the Paris Agreement in a White House ceremony in June. With the recent validation by Syria and Nicaragua, the US is now the only country in the world that has refused to participate in the 2015 Paris Agreement. The Trump Administration’s disdain was evident in Bonn. The US government did not fund a pavilion at the conference, as all other major economies have. Instead, a pavilion – marked with the hashtag #WeAreStillIn – was funded by Bloomberg’s foundation. State and local governments in the US have, if anything, become more engaged thanks to the actions of the Trump Administration. Within days of Trump White House ceremony, more than 1200 US states, tribal nations, cities, companies, and universities declared “We Are Still In,” pledging their support for the objectives of the Paris Agreement. This number has grown to over 2300 entities, according to America’s Pledge, a new report from the Bloomberg Philanthropies. In all, these entities represent more than half of the US economy, equal to the third largest economy in the world, ahead of Japan or Germany. While local action is getting a strong boost in Bonn, it is not a new phenomenon. Austin, the capital city of Texas, has been working on cutting carbon for over 10 years. Austin has made solid progress so far. On the 10th anniversary of the pledge in February, they announced that City operations have cut emissions by 75 percent, largely from buying 100 percent renewable electricity though the municipal utility’s GreenChoice program. The city’s utility, Austin Energy, now gets 31 percent of its total power from wind and solar, up from 4 percent in 2007. They have given out 600,000 energy efficiency rebates, weatherized 18,000 low-income homes, and given green building ratings to 13,000 homes and 400 businesses. As of February, over 6000 customers had gone solar, adding about 46 megawatts of rooftop systems. In 2015, the City Council adopted the Austin Community Climate Plan to achieve net-zero community-wide greenhouse gas emissions by 2050. The current Mayor, Steve Adler attended the 2015 COP21 meetings in Paris, as well as the C40 Mayors Summit in Mexico City in 2016. Speaking at a C40 event in New York in September, Mayor Adler reminded listeners of the side meeting in Paris, where mayors signed their own climate accord. Almost half of carbon reductions under the Paris Agreement, he said, will have to be achieved at the sub-national level. “There is still a lot of opportunity and control for cities,” he said. The partisanship around climate change has created conflict at the federal level, but has spurred action at locally, he argued. Texas, one of the most conservative parts of the US, has paradoxically been antagonistic to climate policies while leading the nation in wind power and rapidly closing coal plants in their fiercely competitive power market. The proof is in the bottom line, he said. With the city on target to hit their renewable energy goals, Austin recently dialed up their ambition. In August, the City Council boosted the municipal utility’s renewable electricity goal to 65 percent by 2027, up from 55 percent renewables by 2025. 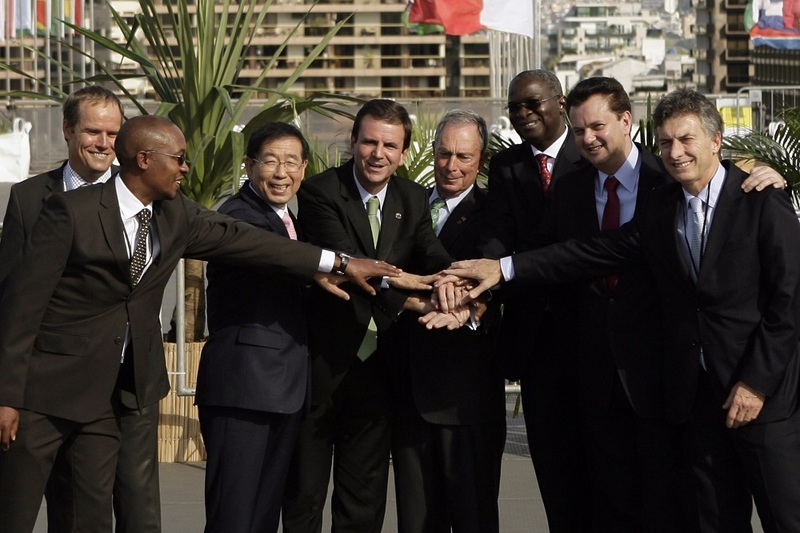 The mayor of Rio de Janeiro, Eduardo Paes, who figures in the old photo, is now out. A moderate sleazy careerist with at least good intentions on climate and air pollution has been replaced by a far-right nutjob. Marcelo Crivella is an evangelical “bishop”, who believes homosexuality is sinful, and has in in the past suggested it may be caused by stress in the womb from unsuccessful abortions. He has questioned evolution and even published libels that Hindus practice child sacrifice. I have not been able to find out if he has similarly crazy views on climate, but rational leadership on the issue cannot be expected.